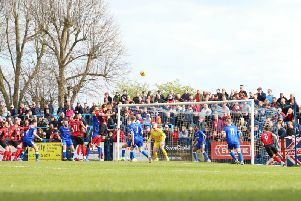 Dan Holman’s first league goal gave Kettering Town a fine 1-0 success in their top-of-the-table clash at Royston Town. The Poppies squad had been hit by a virus ahead of the Buildbase FA Trophy defeat at Stamford but Durrell Berry, Dion Kelly-Evans and Aaron O’Connor all returned to the starting line-up while Lathaniel Rowe-Turner was named among the substitutes. And there was also a first start for nearly two months for Gary Stohrer who suffered a broken foot in September and returned as a second-half substitute last weekend. An even first half saw O’Connor had an effort ruled out for offside but the Poppies grabbed what proved to be the winner three minutes before the break. Marcus Kelly’s free-kick to the far post was headed back by Michael Richens and Holman finished things off from close-range. There were more chances at both ends in the second half with James Potton heading straight at Paul White for the hosts. But Kettering created the better openings and Joe Welch made a fine save from Kelly volley before Rhys Hoenes shot well wide following good play between him and Stohrer. O’Connor flashed one wide of the far post and Hoenes was also denied by the impressive Welch. And it took a fine save from White to deny Potton late on to preserve the three points. The win means Kettering remain top of the Evo-Stik League South Premier Division Central on goal difference from Stourbridge, although the Poppies have two games in hand. And it sets things up perfectly for Tuesday night’s clash between the two sides at Latimer Park. AFC Rushden & Diamonds moved to within a point of the play-off places in the Evo-Stik League South Premier Division Central as they beat bottom side Bedworth United 3-1 to make it two wins in a row at Hayden Road. Unsurprisingly, Andy Peaks named an unchanged starting 11 and unchanged squad following the 2-1 midweek success over Hitchin Town. And Diamonds took the lead on 25 minutes when Sam Brown’s ball into the box saw Jack Bowen challenge the visiting goalkeeper and Bowen won the header, which trickled into the empty net. But the lead was shortlived as Bedworth levelled three minutes later when a long throw was flicked on by Alex Troke and it found the net via the far post. The second half was scrappy but Diamonds regained the lead with 19 minutes to go when Tom Lorraine rose above everyone else to head home Declan Rogers’ corner. And they wrapped things up in the final 10 minutes when Zack Reynolds was fouled in the box and Ben Farrell scored from the penalty spot. Diamonds are back in action on Tuesday night when they make the short trip to take on Banbury United.